Carson Applegate hasn’t wasted any time making an impact this spring for the Hun School baseball team. 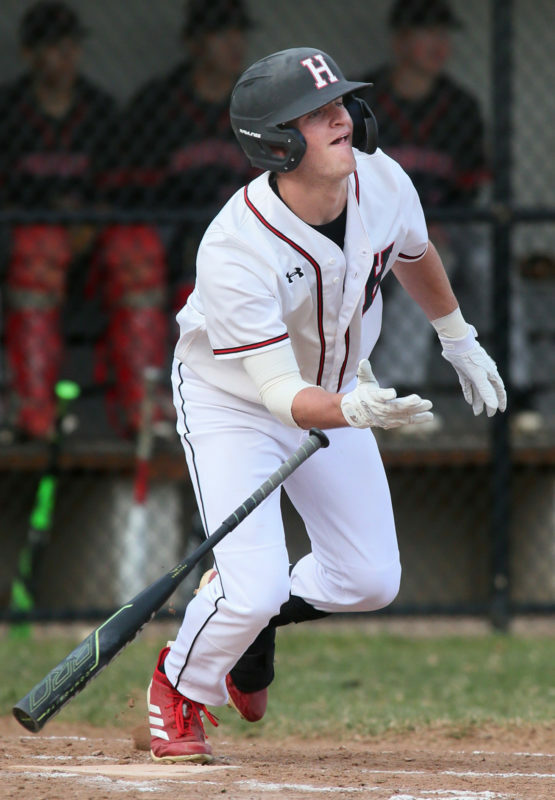 The precocious freshman, who has already committed to attend the University of Kentucky and play for its Division I baseball program, has been the leadoff batter and starting center fielder for the Raiders from day one of his debut campaign. Applegate has enjoyed carving out a role for the Raiders. “As long as I fit into the team, whatever works best for team,” said Applegate. Last Saturday, with undefeated Hun trailing Peddie 1-0 in the bottom of the sixth inning, Applegate proved to be a catalyst for the team. After Ben Petrone drew a walk, Applegate legged out a double. He later scored the go-ahead run on a run-down play, inducing Peddie pitcher Latrell Reid to overthrow the relay. “I was just trying to get on base; I know my teammates are alway behind me in everything that I do,” said Applegate. With Hun having posted five straight routs to start the season, Applegate liked the character the Raiders displayed in rallying to the win over Peddie. defeated St. Augustine 8-5 last Monday and improved to 7-0. Applegate’s older brother, former Hun star Jason Applegate, now a senior pitcher for Villanova, has helped the freshman aspire to do big things. Hun head coach Tom Monfiletto was not surprised that Applegate helped spark the rally against Peddie. “That is the kind of stuff he provides, he is such a great athlete and he is aggressive,” said Monfiletto. In Monfiletto’s view, it was huge for Hun to pull out the win over the Falcons. Senior pitcher Erbeck was very good in his own right, striking out six, walking one, and scattering three hits in going the distance. Monfiletto likes the positive energy he is seeing from his squad so far this spring. “I am happiest about how much they enjoy each other’s success,” said Monfiletto. The Hun players have emphasized making incremental progress on a daily basis. “We ask them to think individually about what they need to work on and every couple of days we will ask them them to verbalize that in front of the whole team,” said Monfiletto, whose team hosts Princeton Day School on April 10, plays at Pennington on April 11, plays at Blair Academy on April 13, and then faces Immaculata High on April 15 at Diamond Nation. Applegate, for his part, sees some very good things ahead for the Raiders.